BACKGROUND: While lung cancer is the leading cancer cause of death, it is largely preventable. Furthermore, early diagnosis enhances the chance of cure. Therefore, we developed guidelines for lung cancer prevention and early detection. METHODS: A multidisciplinary team of experts in lung cancer representing different health-care sectors was assembled based on the National Cancer Center request and in coordination with the Saudi Lung Cancer Association of Saudi Thoracic Society. The team reviewed various reliable international guidelines and the data and experience in the Kingdom and formulated guidelines that address the primary and secondary prevention approaches in lung cancer, including tobacco control, early diagnosis, and lung cancer screening. RESULTS: The team developed guidelines to assist healthcare professionals in the Kingdom manage the different aspects of lung cancer prevention. Primary prevention through tobacco control: the recommendations encourage all healthcare professionals in all practice settings to screen their patients for smoking and to provide counseling and if needed referral to smoking cessation programs for current smokers. 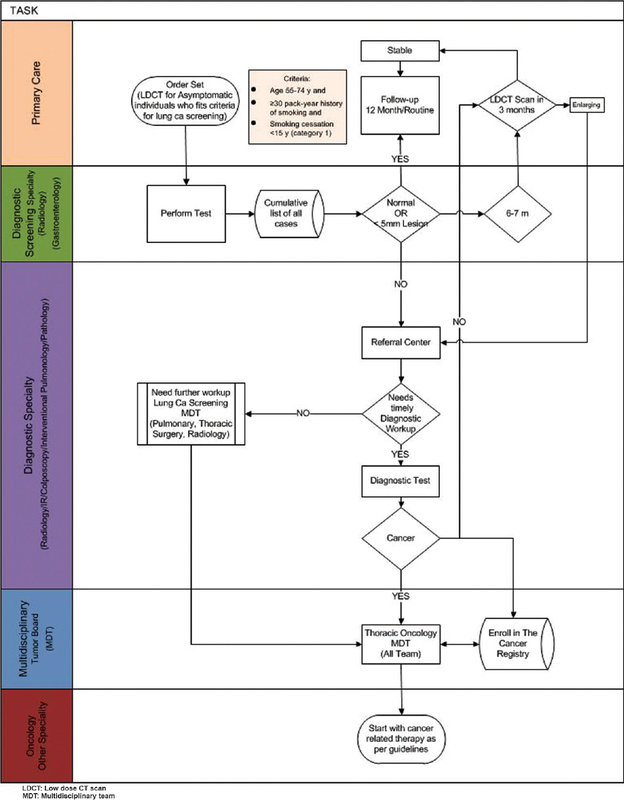 For early diagnosis of patients with symptoms suspicions of lung cancer, it is expected standard of care to investigate, work up, and refer the patients appropriately. Mass screening of patients at high risk for developing lung cancer: the recommendations listed the program requirements, eligible patients, and algorithm to manage findings. However, the team does not recommend that national screening program be mandated or implemented for lung cancer at this stage until more data and studies provide stronger evidence to justify adopting a national program. CONCLUSIONS: Physicians can play an important role in preventing lung cancer by tobacco control and also detect lung cancer at earlier presentation. However, national mass screening programs require further study. Bronchial Thermoplasty is a procedure that involves the delivery of radiofrequency energy during bronchoscopy to airways in order to selectively ablate airway smooth muscles. Bronchial Thermoplasty was approved by the FDA in 2010 and remains the only device based non-pharmacological treatment approach for severe asthma. We appraise the trials leading to the approval of Bronchial Thermoplasty in light of the FDA approval process. Current international guidelines regarding use of Bronchial Thermoplasty and emering pharmacological options for severe asthma are reviewed. 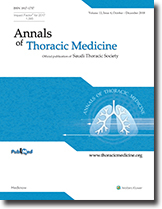 OBJECTIVE: To ascertain: (i) if elderly patients with fixed airflow obstruction (FAO) due to asthma and chronic obstructive pulmonary disease (COPD) have distinct airway morphologic and physiologic changes; (ii) the correlation between the morphology of proximal/peripheral airways and respiratory impedance. METHODS: Twenty-five asthma cases with FAO and 22 COPD patients were enrolled. High-resolution computed tomography was used to measure the wall area (WA) and lumen area (LA) of the proximal airway at the apical segmental bronchus of the right upper lobe (RB1) adjusted by body surface area (BSA) and bronchial wall thickening (BWTr) of the peripheral airways and extent of expiratory air trapping (ATexp). Respiratory impedance included resistance at 5 Hz (R5) and 20 Hz (R20) and resonant frequency (Fres). Total lung capacity (TLC) and residual volume (RV) were measured. RESULTS: Asthma patients had smaller RB1-LA/BSA than COPD patients (10.5 ± 3.4 vs. 13.3 ± 5.0 mm2/m2, P = 0.037). R5 (5.5 ± 2.0 vs. 3.4 ± 1.0 cmH2O/L/s, P = 0.02) and R20(4.2 ± 1.7 vs. 2.6 ± 0.7 cmH2O/L/s, P = 0.001) were higher in asthma cases. ATexp and BWTr were similar in both groups. Regression analysis in asthma showed that forced expiratory volume in one second (FEV1) and Fres were associated with RB1-WA/BSA (R2 = 0.34, P = 0.005) and BWTr (0.5, 0.012), whereas RV/TLC was associated with ATexp (0.38, 0.001). CONCLUSIONS: Asthma patients with FAO had a smaller LA and higher resistance of the proximal airways than COPD patients. 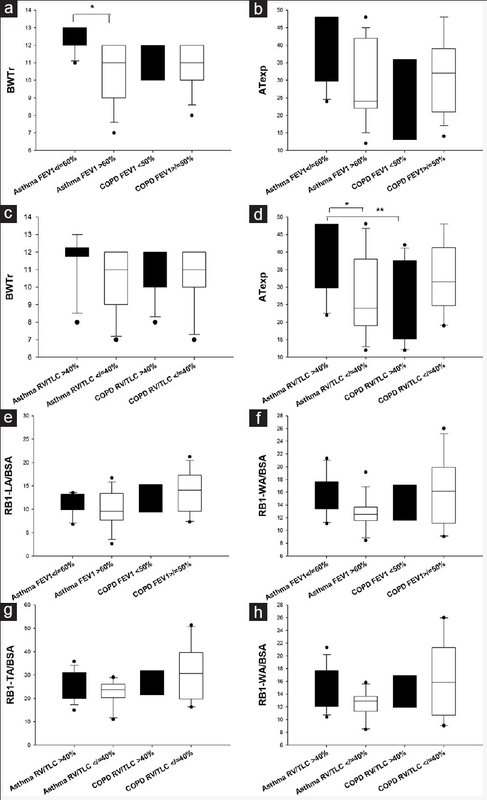 FEV1 and respiratory impedance correlated with airway morphology. BACKGROUND: Polysubstance dependence, stress, and sleep disturbances are inter-related by shared physiological pathways. No study has investigated the relationship between sleep and concurrent use of alcohol and khat. OBJECTIVES: The aim of the study was to assess the effect of the concurrent use of alcohol and khat as well as concurrent alcohol, khat, and tobacco smoking on sleep patterns. METHODS: A sample of community-dwelling adults (n = 339, age = 25.5 ± 5.7 years, body mass index = 22.0 ± 2.2 kg/m2) from Mizan-Aman, Ethiopia, participated in a cross-sectional study. Semi-structured tool for sociodemographics, substance use habit, and the Pittsburgh Sleep Quality Index (PSQI) were used. The difference in sleep patterns among substance use groups, i.e., nonusers, alcohol use only, concurrent alcohol and khat use, and concurrent alcohol, khat and tobacco smoking was assessed. RESULTS: The poorest sleep quality was found among concurrent users of alcohol, khat, and tobacco smoking (PSQI global score = 8.2 ± 2.4), followed by concurrent users of alcohol and khat (PSQI global score = 7.3 ± 2.9) (F (3.335) = 23.64, P < 0.001). There were significant differences in the PSQI component score of sleep quality χ2(3) =159.09, P < 0.001, the PSQI component score of sleep latency χ2(3) = 128.09, P < 0.001, and the PSQI component score of sleep disturbances χ2(3) = 37.69, P < 0.001 between substance use groups. CONCLUSION: Concurrent use of alcohol, khat as well as alcohol, khat, and tobacco smoking was associated with poor sleep. Sleep disturbances in this group need management to avoid the prospective development of psychosocial disturbances in polysubstance users. CONTEXT: To date, there is no gold standard technique for sternum replacement. Current techniques rely on metallic prosthesis, meshes and bars, or bone grafts. However, they have several pitfalls. 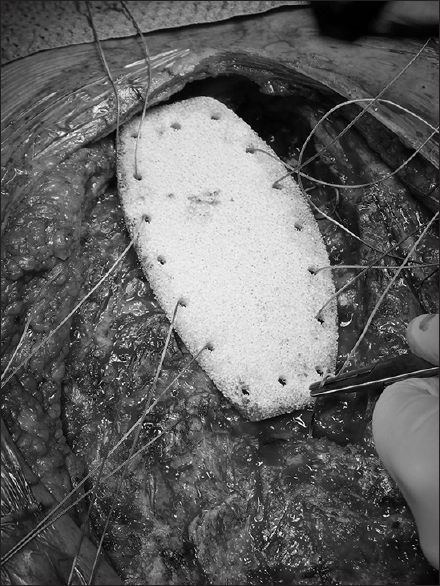 AIMS: The aim of this article is to report the results of sternal replacement with a porous alumina ceramic sternum. SETTINGS AND DESIGN: Surgeries were performed in two teaching hospitals in France. METHODS: We designed a porous alumina ceramic prosthesis which possesses interesting characteristics for this surgery such as great biocompatibility, a certain level of bacterial resistance, radiolucency, and compatibility with radiotherapy. The implant is stitched to the ribs with suture thread and does not require osteosynthesis material. RESULTS: Six patients with a mean age of 60.6 years received this prosthesis. Indication was tumor in five cases and mediastinitis in one case. The mean follow-up is 20 months (3–37 months). No major complication occurred and healing was fine for all patients. Patients did not complain of breathing discomfort or pain related to the prosthesis. CONCLUSIONS: This new technique is promising even if there are only six patients in this study. BACKGROUND: The clinical relevance of positive human rhinovirus (HRV) in hospitalized patients is unclear. Our objective was to describe the clinical characteristics and outcomes of HRV positivity in a heterogeneous population of hospitalized children, compared to those positive for another respiratory virus and those where no respiratory virus was detected. 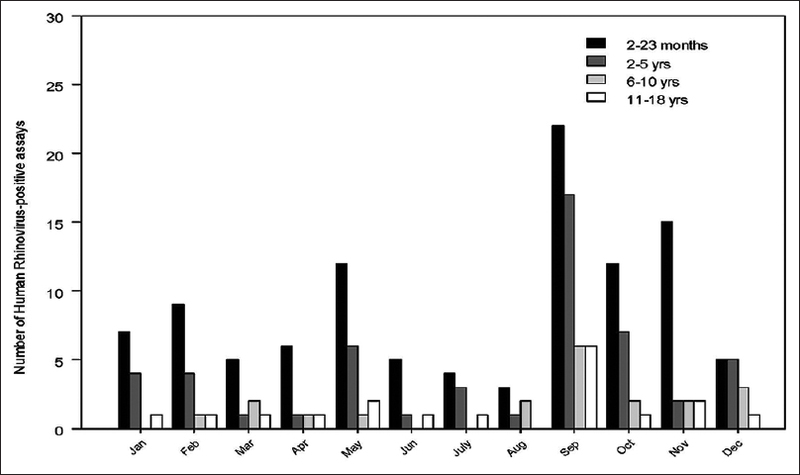 METHODS: A retrospective case–control study of children hospitalized between January 2014 to April 2015 who had a respiratory viral specimen collected. Clinical and laboratory data were collected, and baseline characteristics and clinical variables were compared. RESULTS: During the study period, there were 671 specimens obtained from 577 patients that were processed for the respiratory viral polymerase chain reaction assay, of which 198 were positive for HRV, 167 positive for another respiratory virus, and 306 where no respiratory virus was detected. 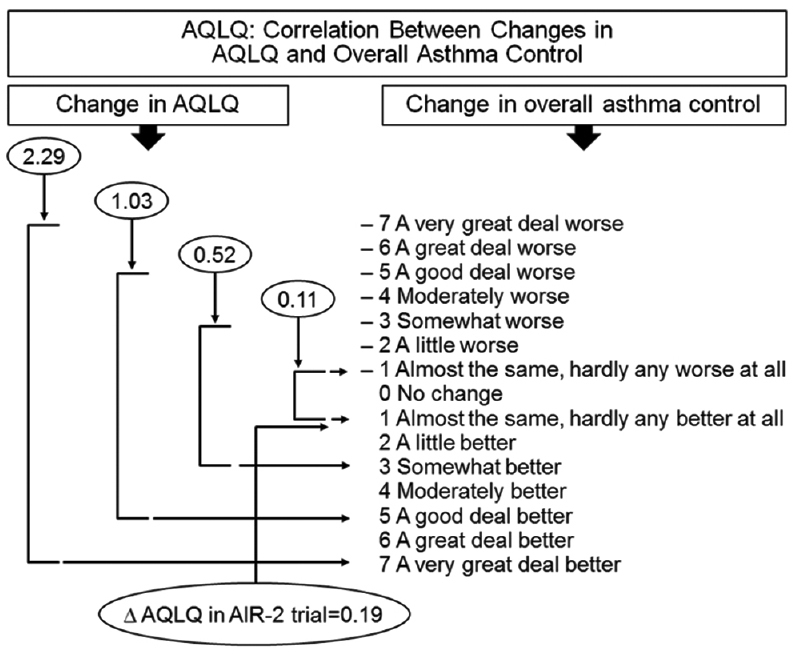 A history of asthma was significantly associated with HRV-positive patients (odds ratio [OR] 3.71; P < 0.001). On multivariate analysis, HRV-positive patients had a higher requirement for mechanical ventilation (OR 1.44), lower rates of readmission (OR 0.53), and lower mortality (OR 0.35) compared to patients with no respiratory virus isolated; however, none were statistically significant. HRV-positive patients did have a significantly shorter length of stay (LOS) compared with patients with no respiratory virus isolated (difference–0.35; P = 0.001). Similar outcomes were seen in patients positive for other respiratory viruses. CONCLUSIONS: HRV-positive hospitalized pediatric patients with a heterogeneous set of clinical diagnoses had higher association with asthma compared to patients who had another, or no, respiratory virus isolated. HRV-positive patients had shorter LOS compared to patients who had no respiratory viruses isolated. These findings suggest that HRV positivity in hospitalized pediatric patients may not lead to adverse clinical outcomes, although asthma is a risk factor regardless of clinical comorbidities and diagnoses. Further research is warranted to understand the predisposition of asthma to HRV positivity. INTRODUCTION: Noninvasive ventilation (NIV) has been extensively used globally and is often administered as the first-line treatment. Currently, data regarding the utilization of NIV in the Kingdom of Saudi Arabia (KSA) is scarce. The present study aimed to assess and quantify the utilization of NIV in clinical practice across the KSA and investigate obstacles that may cause NIV underutilization. METHODS: A web-based survey composed of a 31-item, self-administered questionnaire was developed and validated. The questionnaire was designed to obtain general information about each hospital, availability of NIV practice, use of NIV, and obstacles that can hinder NIV use in clinical settings; the survey was sent to senior respiratory therapists (RTs) of 76 hospitals. Descriptive statistics were used to analyze the data. RESULTS: Sixty-one hospitals (80.3%) responded to the survey (47 governmental and 14 private). NIV was available in all hospitals and all the Intensive Care Units. The majority of RTs (85%) reported having a good experience with NIV, with a confidence rate of 60%; however, only 22% of the RTs had received formal training. 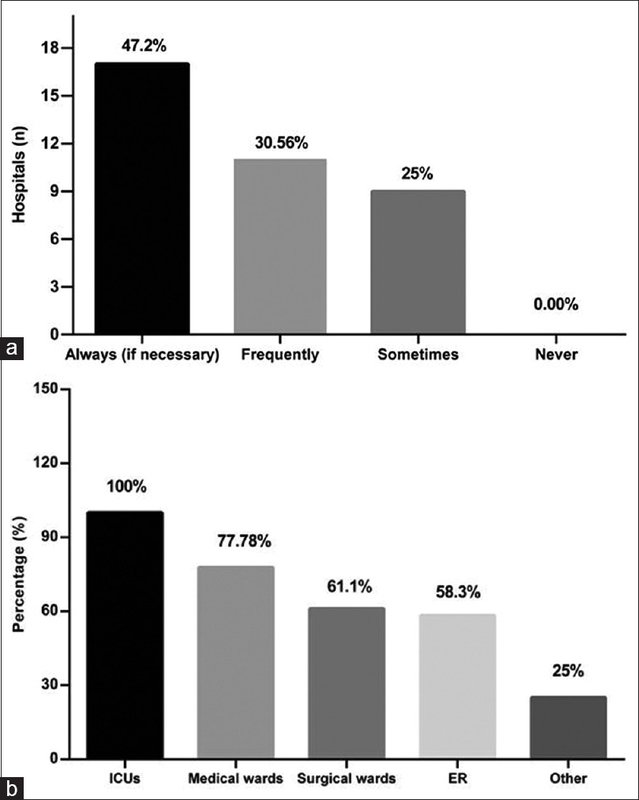 Although NIV setup was the sole responsibility of RTs, only 69% participated in NIV management. Moreover, 72% of hospitals had an NIV setup protocol in place. However, 50% of them lacked a protocol for NIV failure. NIV protocols for specific indications were present in 64% of the hospitals: 47.2% for monitoring and 42% for weaning. The perceived efficiency of NIV practice was low in the medical wards, with a <49% success rate in 39% of the hospitals. Shortage of staff and lack of formal training were the most common reasons for NIV underutilization. CONCLUSION: The efficiency of NIV in the KSA was low. The RTs expressed moderate confidence in administering NIV. Lack of appropriate exposure and formal training could have negative impacts on NIV practice. OBJECTIVE: The objective of this study was to compare the efficacy and safety of radiofrequency ablation (RFA), cryoablation, and microwave ablation (MWA) for patients with lung malignancies. 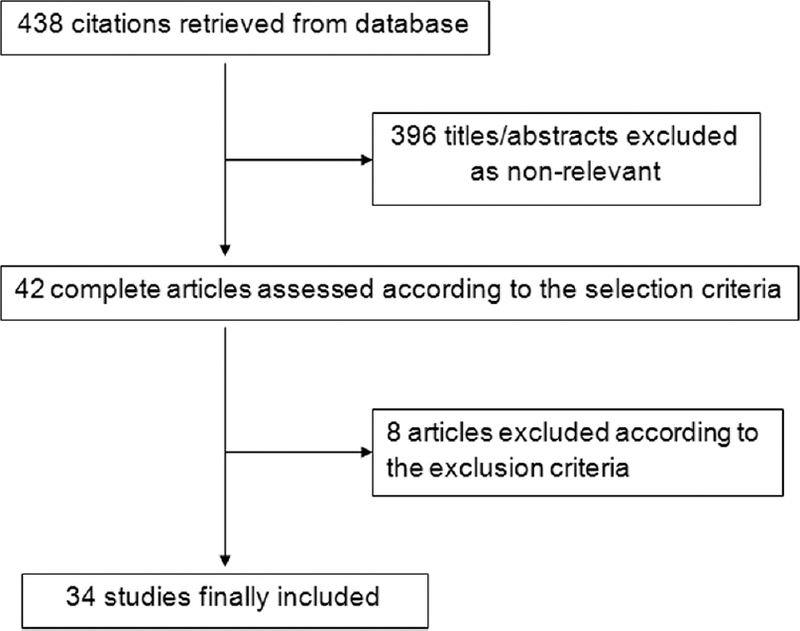 METHODS: We performed a network meta-analysis to identify both direct and indirect evidence from relevant trials by searching PubMed, Embase, and the Cochrane Library to December 31, 2017, for the treatment of malignant lung tumors with the use of RFA, MWA, or cryoablation. We extracted the relevant information from the published studies with a predefined data sheet and assessed the risk of bias with the Cochrane risk of bias tool. The primary outcomes were efficacy (local progression rate and overall survival rate) and safety (major complications rate). We did a random-effects network meta-analysis within a Bayesian framework as well as assessed the quality of evidence contributing to each network estimate using GRADE framework. RESULTS: We collected 34 studies eligible which included 1840 participants and 2520 lung malignancies (1318 primary lung cancer and 1202 pulmonary metastatic tumors). The quality of evidence was rated as very low in most comparisons. From the point of local progression rate, RFA and MWA were significantly more effective than cryoablation with odds ratio (OR) of 0.04 (95% confidence interval [CI]: 0.004, 0.38; P = 0.005) and 0.02 (95% CI: 0.002, 0.24; P = 0.001), respectively. No significant difference was found between MWA and RFA with an OR of 0.63 (95% CI: 0.04, 10.39; P = 0.745). Regarding the major complications, RFA, MWA, and cryoablation showed the comparable safety (P > 0.05). CONCLUSION: RFA and MWA offer an advantage over cryoablation for patients with malignant lung tumors. Pulmonary pleomorphic carcinoma is defined as a nonsmall cell lung carcinoma (NSCLC) that contains at least 10% sarcomatoid components. We report a case of pulmonary pleomorphic carcinoma of which only the sarcomatoid component metastasized to the small bowel and adenocarcinoma was identified on percutaneous transthoracic needle biopsy (PTNB). We suggest that if an NSCLC is diagnosed by PTNB and a sarcoma is found at another site, or vice versa, pulmonary pleomorphic carcinoma with a single metastasis should be considered as a differential diagnosis to establish the best effective treatment plan. Cutis laxa (CL) is a rare connective tissue disease characterized by a loose, wrinkled, and inelastic skin. Here, we report an unusual presentation in a 15-year-old male patient who is a known patient of CL who presented with bilateral pneumothorax. He was successfully managed initially by chest tube insertion and then he was treated surgically with bilateral staged thoracoscopy, apical bullectomy, and pleurodesis with full uneventful recovery.